This customer is having a full Japanese Style sleeve done by our Artist Iain Nosaint. Iain is the only Tattoo Artist working here at I Aint No Saint. 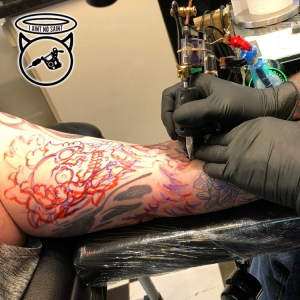 We are a Tattoo Studio located in Abbots Langley, so if you are looking for a Hemel Hempstead Tattoo Studio we are a 10 minute drive from Hemel Hempstead Town centre. Part of an ongoing sleeve, this customer wanted an interesting piece to fill the inside bicep. 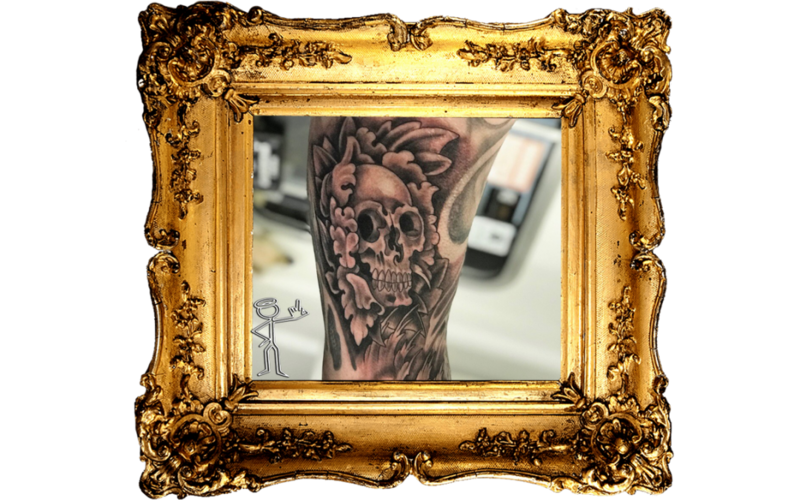 Iain drew the Skull & Peony on freehand, going through these freehand steps to create the image. Once all the freehand work was done, it was time for our regular customer Aaron to get inked! 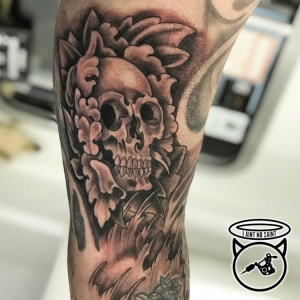 He sat for a half day session (5 hours for the price of 4) and got this piece drawn and finished as well as some of the background in for the rest of the sleeve. If you want to see more of Iain’s work, take a look at his gallery here. Why not get in contact with us today to get booked in for a new Tattoo? Or you are welcome to come to the Studio during our opening times to have a chat and get your next bit of ink booked!